Swedish “suicidal black metal” band SHINING will release its new album, “X – Varg Utan Flock”, on January 5 via Season Of Mist. The artwork for the disc was created by Kevin Rolly and can be viewed below. The song “Gyllene Portarnas Bro” (which translates as “Golden Gate Bridge”) can be streamed below. Niklas Kvarforth is not the first artist struggling with mental illness and related issues. The erratic Swede is also not the first musician whose inner demons are part of the creative genius. Yet in the world of metal, his band SHINING remains as a unique and outstanding act in terms of talent and musical excellence. Never shy about his personal afflictions, Niklas Kvarforth is once again baring his tortured soul with “X – Varg Utan Flock”. His anger, his confusion, his pain, and his torment are all becoming tangible on the tenth album in the band’s long history. For a point of reference, the legendary “V – Halmstad” release probably offers the most appropriate comparison. Yet all the influences SHINING fused into their previous masterpiece, “IX – Everyone, Everything, Everywhere, Ends” (2015) are also still present. Eclectic influences from progressive rock, jazz, classical music, and even faint traces of pop have left their mark. In addition to the broad musical spectrum on display, Niklas Kvarforth‘s deeply emotional laments emerging from the dark depths of his twisted mind go beyond the usual scale of metal bands in their great vocal scope and variety. Founded in 1996 by Kvarforth, SHINING self-released “Submit To Self-Destruction” in 1998 and spawned the term “suicidal black metal” with this debut seven-inch single. A couple years after first full-length, “I – Within Deep Dark Chambers” (2000) and sophomore album, “II – Livets Ändhållplats” (2001) had cut deep marks into the underground scene, Niklas replaced his whole crew, which started a continuous cycle of lineup changes. With MAYHEM drummer Hellhammer on board, “III – Angst” (2003) and “IV – The Eerie Cold” (2005) began to gather major press attention. At the same time, SHINING focused on bringing their vision and often controversially received live performances to Europe. Yet Kvarforth‘s mental health led to cancelations, physical and psychological fights within the band, and finally a break-up. 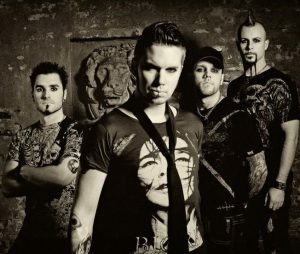 Not content to let things rest after his breakdown, the restless singer returned with new members and the acclaimed masterpiece, “V – Halmstad”, in 2007. By then SHINING had reached headliner status and toured with other great acts such as SATYRICON and MAYHEM. Several lineup changes later, the Swede recorded two albums in one session: “VI – Klagopsalmer” was released in 2009, to be followed by “VII – Född Förlorare” two years later. 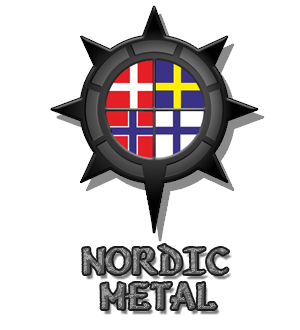 The band also received their first gold disc for the single “Förtvivlan, Min Arvedel” in Sweden. After rotating more musicians in and out, SHINING returned with “Redefining Darkness” (2012) and a less aggressive, yet more sinister sound. Before signing to Season Of Mist, the band released the project “8 ½ – Feberdrömmar I Vaket Tillstånd”, which featured six of Kvarforth‘s favorite vocalists. In August 2014, SHINING entered Andy LaRocque‘s Sonic Train Studios to record their ninth album, “IX – Everyone, Everything, Everywhere, Ends” as the sum of Niklas Kvarforth‘s musical evolution and experience. More line-up changes and breakdowns followed. Yet Niklas Kvarforth clawed his way up from the depths once more and returned to Andy LaRocque and Sonic Train Studios to record another album. The result, “X – Varg Utan Flock” is a musical masterpiece far beyond simple genre limitations and a shining tribute to the achievement that a troubled mind is capable of when driven by a passionate will to excel and overcome.